Updated: 2019-04-04 12:45:50 - Corded electric weed eaters have come a long way in the past decade. Benefiting from efficiency gains made by all electric motors, these tools are now powerful enough to handle most any yard that is small enough to meet the extension cord requirement. This guide will help you determine if a corded weed eater is right for you by providing both the pluses and the minuses of owning one. We’ll also provide you with our picks for the best corded electric string trimmer available on the market today. There are many reasons why someone would choose a corded weed trimmer over ones powered by gasoline or lithium-ion batteries. Lightweight: Corded string trimmers are very lightweight. They are usually among the lightest string trimmer on the market because they don’t have to carry their energy source. No gas or battery is necessary. Quiet: Electric motors are much quieter than internal-combustion ones. Some models of electric wackers are silent enough that you don’t need to wear hearing protection. There’s not a gas-powered eater on the market that I know of that is that quiet. If you live close to your neighbors, this is a feature to consider. Always Powered: With no need for gas, corded trimmers can go forever without stopping. As long as the power is on in your neighborhood you will be able to trim. Easy to Use: There’s no mixing of gas and oil or pulling to start. There’s no end-of-season maintenance required. To operate, you simply plug it in and pull a trigger. Less Expensive: This isn’t always the case, but you’ll often find a corded grass string trimmer is cheaper than a similar powered battery or gas powered one. Limited Mobility: This is the primary reason why people pass over corded electric weed trimmers. Your extension cord dictates how far away from your house you can trim. While it depends on the amp rating of your motor and the gaugue of your extension cord, the MAXIMUM distance you can safely trim away from your house is 150ft. If that’s not a problem for you, then a corded tool is a great choice. Cord Gets In The Way: Most of the time, this isn’t an issue – the extension cord is safely out of the way. But it only takes one lapse to turn your dull day into an exciting one. Usually the trimmer just nicks the cord, but even then you really need to get a new one before continuing. AC electricity isn’t something to be taken lightly. Who Should Buy An Electric Weed Eater? Electric, corded trimmers are ideal for small yards that don’t have fence or property-lines more than 100 feet from the outdoor outlet on the house. This includes many urban homeowners, and some condo-owners that take care of their own yard work. Once again, the cord requirement is really the limiting factor in buying and using an electric weed eater. There are hundreds of electric trimmers on the market, but no two are the same. Some are high quality, while others pure junk. We have compiled a list of the best sellers and top rated corded trimmers on the market to help you pick the best possible one for your needs. This is a lightweight weed eater manufactured by GreenWorks – a top producer and supplier of power equipment. Make sure you have a 12 or 14 gauge extension cord available if you wish to use this machine farther than 50 feet from your house. Power like this needs a thicker gauge of extension cord to power it than other, less-powerful models. Powered by a 10 amp motor, it has more than enough oomph to get the job done. It’s so powerful you should make sure you don’t have any other higher-wattage equipment running on the same circuit when you are out trimming. Like all GreenWorks trimmers and tools, it was designed to last. 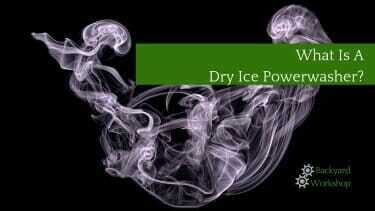 Greenworks covers this product with a 4 year warranty. You should be using this trimmer for many years to come..
There’s very little maintenance or effort needed to use this wacker. Plug it in, pull the trigger and begin to kill tall grass and weeds. This straight-shaft trimmer allows you to reach hard-to-mow areas with ease. There is also a telescoping handle to fit most body types so you don’t tire unnecessarily fast. The ergonomic handle is designed to offer complete control and comfort to reduce fatigue. The machine can utilize various gas attachments to extend the usage of this product. While you need to buy them separately, you can get attachments that transform this product into a rotor-tiller, blower, hedge-trimmer or branch pruner. If you don’t want to have multiple tools lying around, this is a good fit for you. Its double string is highly durable and does an excellent job on even tall weeds. It offers one of the widest cutting swaths of 18 inches with 0.080″ line. This helps you speed up the slashing process by covering more grass per pass. Overall, this is one of the most versatile and powerful corded trimmers we have ever seen. It’s very easy to use, yet intuitive enough to make for a complete, all in one tool. One of the most versatile and reliable corded trimmers you will find is the Black and Decker MTE912. If you have a yard on the smaller side, this tool will be all you need to cut and trim. The weed trimmer attaches to a base with wheels and can be used to mow a small yard. In a pinch, you could use this for a medium-sized yard as well, though you probably don’t want to do that week after week. When you are done with the mower, remove the base to free the trimmer and use it trim those pesky weeds. Finally, flip the trimmer head 90 degrees and use it to edge your pathways for a complete job that will look great. While it’s not the absolute lightest one available, this weed eater is definitely lightweight. The total unit weighs just 13 pounds when put together- but the trimmer itself is much lighter. The mower base is a heavier piece of this tool. It does use a cord to get its power, so you will need to purchase an extension cord if you don’t already have one. The 6.5 amp motor that powers this grass clipper is reliable and efficient.. The transmission is also well built. It was made so that it does not get bogged down when cutting through thicker weeds. It’s deigned to be quiet, yet powerful and very easy to use. If you are used to a gas-powered trimmer, you’ll be surprised by how quiet this tool is in use. The trimmer itself has an auto feed spool to feed string to your trimmer head all the time. Don’t try to “bump” line forward – you run the risk of damaging the head if you do it too often. Its 12” cutting diameter will get the job done fast as well. The unit is very easy to use despite its many features. Simply lock the trimmer onto the base by snapping it in. Pull the trigger on the trimmer and push like you would a regular push mower. The wheels on the base can be adjusted to cut the grass at different heights. Quite possibly, one of the most versatile and reliable string trimmers on the market, this unit is ideal for small yards up to 1,200 square feet. It’s built by one of the leaders in power tools Black and Decker, so you know you are getting quality. Incorporating a lightweight design of 7.5 pounds with a dimension of 5.9 x 9.8 x 40.2 inches, this is one excellent tool that speaks to the company’s reputation. One of the best features of this trimmer is the cord. Unlike most corded trimmers, the 51480 trimmer does not feature any cord limitations. It comes with an extra-long power cord that is perfectly attached so that it won’t get tangled up while you are working. 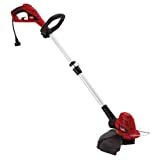 The powerful 120V AC, 5 amp motor allows you to effortlessly cut through thick weeds and grass. This high-speed motor is designed for increased durability and reliability. It is one motor that will last you for many years to come, which makes it an economical long-term investment. Like most Toro products, this one is designed to perform multi functions so that you don’t have to buy extra tools – saving you money! The trimmer head pivots and turns into an edger at the push of a button. There’s also wheels to help guide the edger for a perfect looking cut. The aluminum shaft is long enough to reach into tight spots that other trimmers can’t. Not only is it versatile, it is lightweight and durable. There’s’ no risk of rust forming on the shaft if it is accidentally left out in the rain. There’s an assist handle on the shaft as well. This makes for even greater control and less user fatigue. A wide cutting path of 14” is offered on the trimmer head. It also has an auto feed spool that lets you keep working, instead of always bumping the head for more string. Don’t bump – you will risk damaging the head. Since this motor is a little less powerful than the other ones we’ve reviewed, it uses a smaller diameter grass trimmer line as well. That makes the head a bit lighter, but can mean less cutting power before the line breaks. The Toro is a great trimmer for small to medium size yards. Its versatility and durability make it a great option. It comes with a good warranty to help keep your mind at ease as well. We’ve selected another BLACK+DECKER branded trimmer for our list. It’s no surprise; BLACK+DECKER has been making reasonably-priced powertools of good quality for generations. The GH900 continues that tradition. It has an excellent feed system, commendable transmission, and ergonomic design. With this innovative feature, you can expect that the performance will be dependable. This holds true even when it comes to the toughest jobs. Complemented by the 6.5-amp motor of the unit, you can be confident that it will handle most any job in a smaller-sized yard. There’s no need to stop and bump the head to advance the line. Just start and stop, repeating until enough line has advanced to continue your job. One thing that many people did not like about corded string trimmers is that they can cause their operators to trip on the power cord. Accidentally stepping on the cord is another common occurrence. The cord retention system built-in to this product helps to reduce these annoying occurrences. If you are looking for a versatile option, you might love this product. It functions not only as a trimmer, but also as an edger. Switching from one function to another can be accomplished in a snap. There is a wheel integrated into the unit – believe me, this makes edging straighter MUCH easier. 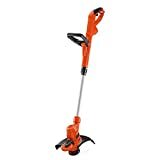 In summary, this product from Black+Decker is a remarkable choice for the best string trimmer. More than just brand name, it has an quality motor with an impressive transmission, allowing it to tackle even the most difficult tasks. Plus, it is a great investment because you will essentially enjoy two functions in a single product. Electric weed eaters serve a great purpose. They are a cost effective way for those with smaller yards to get their yard work done. Even if you have a medium size yard with thicker weeds, an electric weed eater could be a solid buy. They are powerful, very easy to use and offer a wide range of functions. Just be sure your yard isn’t too big before you buy one. Nothing is more annoying than watching weeds grow just outside of your corded weed eater’s reach – all because you didn’t measure beforehand. Most buyers choose corded tools because there is no need to mess with gas or keep track of which battery is in the charger. They last a long time with little to no maintenance. And did we mention they are very easy to use! 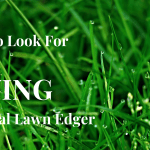 Their low cost also appeals to most looking for a best weed eater. 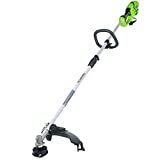 When you consider all that you get with an electric trimmer, you really can’t beat the price. Yes, this is really an ultimate guide. Thank you for compiling this review, I need a new weed wacker and this review is super helpful! Limited mobility is a downfall of a corded appliance. I have a rather large yard and have been connecting cords together so I can reach everywhere I need to go. I will have to consider this option seeing that I have all the cords in the shed for this. I am surprised that there is still the option of a cord is there. I had no idea that this option wasn’t as powerful as the other options. I did not know that there was such a difference between power units. Quite comprehensive review on corded weed eaters. I was kind of hoping you’d present cordless or battery ones. I’d worry that if I was in thick grass, I’d end up cutting the cord, literally and that could be scary. Wow, 5.5 to 6.5 Amps, presumably at 110V, that’s pretty strong motor, I imagine these babies could handle some pretty thick patches without too much trouble, though I got to wonder about maintenance and cleaning of these tools to ensure they last. I remember my lawn mowers as a kid and having to clean off the dried, wet grass. Nice report! I really like that Toro 51480! Wow! This is one of the most comprehensive guides I’ve seen yet on weedeaters. If I can’t find anything here, then it must not exist – or either not good enough. Thanks for all your work! Nice reviews, I will try the Black&Decker brand. They seem to be pretty solid. I will try that the Toro being that it’s a good trimmer for smaller or medium yard. This sounds like exactly what I’ve been looking for! This is truly and ultimate guide to weedeaters. I never even knew that anyone wrote an ultimate guide to a weedeater. The web is so fabulous guess you can find a specialist in every niche! Thanks for sharing your expertise! Can you speak to the long-term durability of these models? 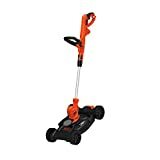 I’m looking to replace a Black & Decker trimmer (not the model reviewed here) that broke down almost the moment it was out of warranty. The best value on a trimmer will be the one I don’t have to keep replacing every couple of years. Assuming that you want to use a corded electric weed eater… GreenWorks 21142 is always one of the top electric models I believe, the quality is very solid and it has good features, such as: auto-feed, gas powered attachment… And I’ve used this one for ~4 years with no evidence of durability issues. Cordless are not and will never be as powerful as a corded weed eater. No matter who tells you differently. Gas powered is the most powerful without a doubt. Corded weed eaters, if one would simply have the correct size/gauge/length of extension cord can do any ‘normal’ yard. 100 foot cord for up to 7 amps use a 16 gauge as a minimum. Very light, easy to roll up and store. 100 foot cord for over 10 and under 15 amps use a 14 gauge as a minimum. Very light, easy to roll up and store. If you have a very large piece of property, odds are you can afford a gas unit and can afford to send it in every year because you did not put it away for the winter correctly nor did you change plugs or use gas saver. If you’re going corded try to find one that has a trigger so you can control how hard each weed gets weedwacked. That helps a lot because it gives you much better control and protects you if the weeds try to fight or you’re like me and are trying to be harder on weeds that are attacking flowers and other plants. The better models also will help the weedwacking by having a separate part other than the engine and string just for the weeds that cries with them as you go. This is a very sweet, kind, and caring feature and can help take a lot of work off of you since its one less thing to worry about. Weedwacking is hard enough to do as it is! The battery powered units are not as powerful as the corded units. That is speaking about real weedeating and not just some blades of grass one is trimming. Gas is the most powerful but is a mess. Cordless is convenient but not for anything other than a normal residential lot and some are even too big for this. Corded are overall the most convenient and powerful without the gas/mix/mess/smoke that accompanies it. Every home has outside outlets and there are few homes that are not able to reach all corners of a lot with a 100 foot cord. I’m not saying there are no exceptions to this but most homes do not set on lots that are 200 feet wide or 250 feet deep. A 100 foot cord should reach everywhere and can be rolled up very easily if one purchases a hand roller or other device and is not one of those homeowners that rolls up a cord on their arm and tosses it in the corner to be untangled next time it is needed. Common sense prevails so cordless should do grass fine but for ‘weeds’ one needs a bit more power and corded is preferred. Yes, if you’re doing weeds they need to be punished and cordless won’t be able to do it. Gas can but for girls it will be hard to control it. Corded has the power to kill the weeds and is easy to control for girls. Also please make sure to wear running shoes to help the weed wacker’s job. You can do the weeds in socks too, but bare feet isn’t enough to keep the weeds from fighting if they get really bad. Electric weed wackers are only for us girls and women since we’re naturally going to be better at weedwacking and because we’re more in touch with our feelings and how the weed wacker and weeds are doing. Basically, we need the instant response to how we’re feeling. With how intense we can make it feel the gas weedwackers are hard for us to keep under control and wear us out quickly. That being said girls and women can also use gas weed wackers when they are needed. Guys should only use gas weed wackers since they have more aids and the weight is more suited for them. Did you use the Black and Decker GH900? I do not know how anyone would find this machine functional. The line does not come out far enough to do any kind of good trimming an and the edger is worthless. I used two spools of line in 10 minutes. I would not use this if someone paid me..
That’s the love-hate relationship with 0.065″ line. I use a B+D cordless model at my house with a smaller yard that has a 0.065″ like the GH900. I love it. Doesn’t damage trees or fences if you get too close like other, thicker lines have when I let my kids do yardwork. I went all summer without using a quarter of a spool. On the negative side, I lent it to my father-in-law to clean out his over-grown garden. He had weeds in there as thick as a pool cue (no joke). Obviously, that wasn’t as pleasant an experience for him. He went through an entire spool before he used up one 2amp battery. You need a thicker line for that type of work. One of the items on my “to-do” list is to see if you can use 0.09″ or 0.1″ line with a smaller unit. B+D as a warning on the unit and in the manual not to, but I’m wondering if you can get away with it for temp jobs when dealing with thicker weeds. I’ll let you know what the results are when I get it done. Nothing against Amazon, but how come it is listed as the only sores to purchase these trimmers? Hi Hedi. I agree, Amazon shouldn’t be the only place you look when shopping. It is convenient for many people, but there are other locations where you can buy the tool as well. We are working on having more stores to buy from – with our goal to have some national co-ops with their own buy button. But for now, sure, shop around.